Mold can exhibit a sort of Goldilocks complex. Given the right conditions, mold can do a lot of damage to a property if not taken care of quickly. Within 24-48 hours, mold can grow and begin to reproduce by releasing spores throughout a property. If mold becomes an issue in a home or business, it is important to contact a professional mold remediation company that is certified and insured to clean up a mold problem. In Chippewa Falls, the best mold remediation team can be found at Trac Solutions. Mold is a naturally occurring organism with the job of breaking down dead organic materials. With excess moisture, humid climate and enough “food” mold can thrive in harsh conditions. There are over hundreds of thousands of species of mold, but there are four that commonly appear indoors. black or olive-green in color. color with a strong musty odor. with a wooly or feather texture. appear black, white, brown, gray, green and yellow in color. Mold has been linked to allergic reactions, asthma attacks, and respiratory issues. Inhaling mold spores can be very serious for your health, dead and dormant mold spores can be just as harmful and dangerous as live spores if inhaled. Serious conditions could occur, affecting your heart, lungs, blood pressure and impact the growth and development of unborn babies. Mold removal professionals can find the primary source of any mold infestation and remove it at the source so that it won’t return. As mentioned previously, within 24 to 48 hours, mold can grow and begin to reproduce by releasing spores Typically, mold will grow in dark, damp areas. Bathrooms, basements, and utility rooms are among the most vulnerable areas where water damage and mold growth may occur. Not all mold is visible, but may also be identified by a distinct musty, foul odor. 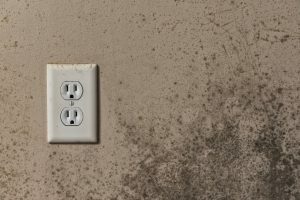 If you begin to notice a distinct odor or if you start seeing surface mold, it could indicate an underlying cause of water damage which should be found and repaired immediately. Prolonged water damage or neglected mold remediation can cause serious damage to your property, which over time could require extensive remediation and repair. Today’s modern building practices actually can cause an increase in mold growth in your home or office. In order for homes and buildings to be energy efficient, we’ve created tight seals eliminating any air leakage from windows and doors. As a result, rooms that have excess moisture present will be more susceptible to mold growth. Proper ventilation is required to remove moisture from the air. To reduce mold growth on your property, make sure plumbing is insulated and fans and proper ventilation is installed in areas where there is excess moisture present. Cleaning surface mold can act as a band-aid, but it won’t resolve the underlying condition that is contributing to mold growth. A certified technician will be able to inspect your property for water damage and use tools to detect visible, hidden and dormant spores. The technician be able to access where the issue is originating and determine the type of mold and be able to eradicate and clean the surface. Don’t hesitate to take action if you find mold on your property, call the professionals of Trac-Solutions today.